Micronesica is a multidisciplinary, peer review journal encompassing natural science topics from Micronesia and the surrounding Pacific region. We publish scientific research reports, notes, review papers, bibliographies, and book reviews in agriculture, anthropology, biology, chemistry, geology, and related fields on the basis of their originality and their pertinence to region. Micronesica is published by the University of Guam, and since 2013 is an open access journal. During its 50-year history, Micronesica has established a reputation as a vital venue and repository for information on the natural sciences in Micronesia. 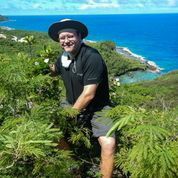 The peer-reviewed articles are of lasting value, documenting flora, fauna, and the natural history of the human populations on islands undergoing rapid changes. There are many "classic" papers, referred to long after publication. Many new species have been described in our pages; new biological records and checklists of species are also regular features. Reports range in approach from wildlife records, to local names of species, experimental studies, and taxonomic monographs. We have published conferences on Micronesian archaeology, pest species in the Pacific Islands, and other topics, and we are now the vehicle for the long-established series Insects of Micronesia, in collaboration with the Bishop Museum, Hawai'i. Micronesica provides a vehicle for authors from outside the region to bring their results back to the region while having them available worldwide. As an open access journal, all our content is freely available without charge to the user or his/her institution. Users are allowed to read, download, copy, distribute, print, search, or link to the full texts of the articles in this journal without asking prior permission from the publisher or the author; other rights are protected under a Creative Commons license (CC BY-NC-ND). This is in accordance with the BOAI definition of “open access”. Currently, all articles from volume 31 (1999) to date are available as PDF downloads from this website. We anticipate adding content prior to volume 31 in the coming months. College of Natural & Applied Sciences, University of Guam UOG Station, Mangilao, Guam 96923, U.S.A.
Western Pacific Tropical Research Center, University of Guam UOG Station, Mangilao, Guam 96923, U.S.A.
Micronesica is a forum for original research in the fields of archaeology, physical and medical anthropology, anthropological linguistics; systematic and ecological botany and zoology, agricultural sciences, marine sciences, and related disciplines concerned primarily with Micronesia and adjacent Pacific islands. Manuscripts for consideration should be sent to Dr. G. Curt Fiedler at the address above, and should follow the most recent guidelines (posted on our web-site). Manuscripts in the Insects of Micronesia series should be sent to Dr. Neal Evenhuis at the address above and the editor for Micronesica. All articles are freely downloadable and protected by a Creative Commons license (CC BY-NC-ND). Views expressed by the authors are their own and do not necessarily reflect those of the University, the editors or printers.